There are approximately 43 species in the genus Ageratum. Ageratum is derived from the Greek “a geras,” meaning non-aging, referring to the longevity of the flowers. These annual or perennial herbs and shrubs in the plant family Compositae (Asteraceae) are all native to Central and South America. One species – A. houstonianum from Mexico, named for William Houston (1695-1733), a Scottish physician who collected the first plants – is commonly used as a bedding plant. The flowers on this tender annual come mostly in shades of blue, but can be pink, lavender or white. 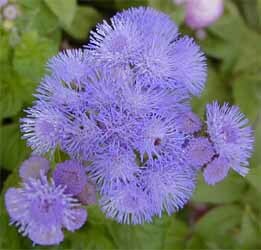 Ageratum is one of the few annuals with a truly blue flower. The soft fuzzy flowers are dainty and feathery, often delightfully fragrant, and usually completely cover the plants. Each flower cluster consists of five to 15 tubular florets. 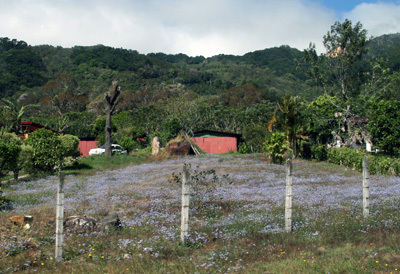 A field in Costa Rica with wild ageratum in bloom. The species grows to a height of over two feet and reseeds itself liberally. The varieties offered by nurseries and garden centers are almost all hybrids that are more compact and better behaved. Ageratum grows in neat mounds, flowering from late spring through fall, and is one of the more dependable flowering annuals. The oval to heart shaped leaves grow up to 2″ long. Because of its short stature, it is best used for edging or borders of beds, in rock gardens, or in containers. The blue varieties combine well with pink in the garden. 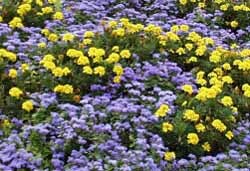 Combine soft blue Ageratum with pink begonias for a low pastel ground cover, or mass them with short yellow marigolds or celosia for more contrast. The tall blue types go well with yellow cosmos. Try mixing the powder blue varieties with white petunias, lamb’s ear or dark blue lobelia. Start Ageratum seeds in February to March (8-10 weeks). Surface sow, barely covering with vermiculite or just gently firm down the potting mix. Do not exclude light, as this helps germination. Germination usually takes 7-21 days. Blue ageratum and yellow marigolds provide nice contrasting colors. Transplant the seedlings when they are large enough to handle, into trays or pots. 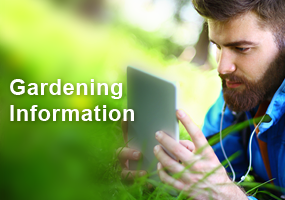 Move outside to harden off and transplant into the garden when all risk of frost has passed. Plant 6-8″ apart in a sunny spot. 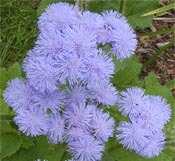 Ageratum prefers a moist, well drained soil but will tolerate dry conditions. Ageratum generally do not have insect or disease problems, although sometimes spider mites can affect the plants, especially in hot, dry weather. On most varieties the old flowerheads turn brown and remain on the plants (some are self-cleaning). Deadhead regularly to improve the appearance of the plants and prolong blooming. The frost tender plants can be covered on cold nights to extend their life in the fall. There are many different varieties of Ageratum. ‘Blue Blazer’ was the first commercial F1 hybrid to be produced. It had better better plant uniformity, vigor, and earlier bloom than the open-pollinated cultivars. ‘Blue Danube’ was bred using a male sterile parent selected from a population of ‘Blue Carpet.’ This plant is one of the best for uniformity, earliness and general performance in the garden. The compact plants to 6-8″ are covered with mid-blue flowers. ‘Blue Horizon’ is a new cut flower F1 hybrid. Purplish-blue 3″ flower clusters are borne on long stems on this vigorous garden plant which grows to 30″ tall. 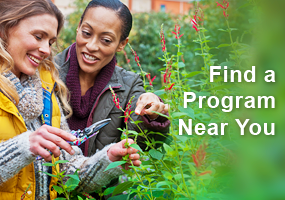 Plants will flower 13-15 weeks from seeding. 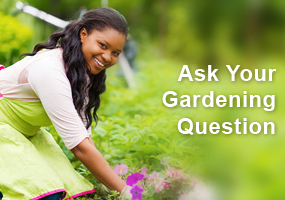 Make 2-3 successive plantings for continuous blooms from early summer to frost. ‘White Bouquet’ is similar to ‘Blue Horizon,’ but with snow-white blooms. ‘Blue Mink’ is an open-pollinated cultivar with powder-blue flowers on 12″ plants. The ‘Hawaii’ F1 hybrid series offers soft pink, royal blue and pure white flowers. It tends to be earlier and longer flowering than other Ageratums. The dwarf, very uniform, compact plants to 8″, covered in a profusion of powder-puff blooms all season long. ‘Pinky’ produces salmon pink flowers on bushy and compact 8″ plants. ‘Purple Fields’ is another F1 hybrid that produces compact, mounded plants. This vigorous grower spreads up to 12″ across, and is covered with unusual, purple flowers. ‘Summer Snow’ is a F1 hybrid with fluffy white flowers. 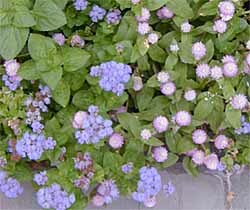 ‘Trinidad’ is a unique, early-blooming blend of white, blue shades, violet and pink on 6″ plants. Thank you for the info on Ageratum. It really is a nice border plant, a little hard to dead-head the flowers are so small. I have planted the pink variety one year but the nurseries don’t really carry it too often. Some years I plant Lobelia for a change on my blue boarder and I get a few Ageratum volunteers that I love to transplant to a different location in the yard.